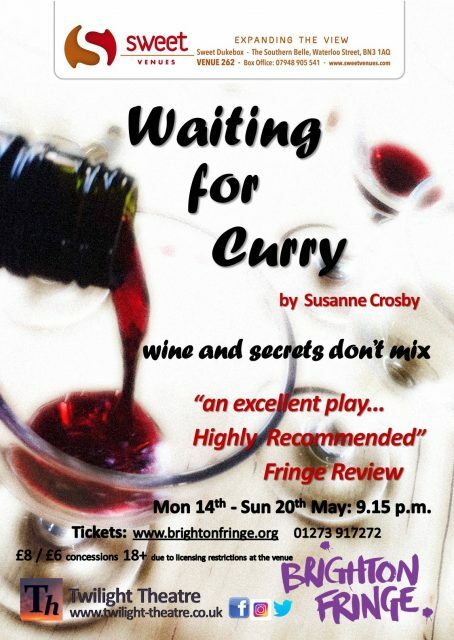 So we’re very excited about our next play, “Waiting for Curry”, which opens on 14 May and runs until 20 May, as part of the Brighton Fringe Festival. 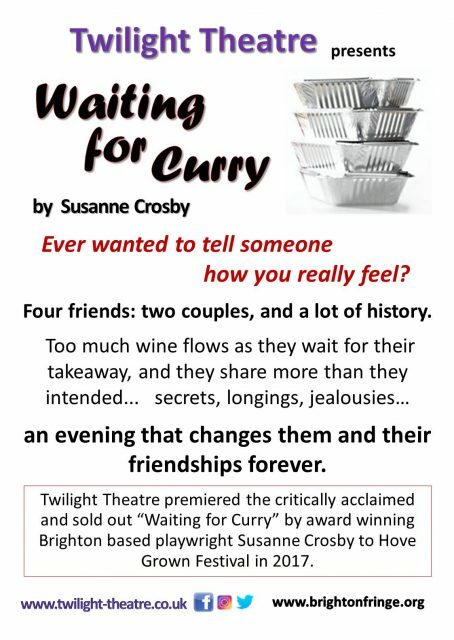 This play premiered at the Hove Grown Festival in 2017 for two nights and was a big hit (see “Waiting for Curry” previous productions tab). It was sold out with people queuing for returns on the last night and people turned away because there was no room. 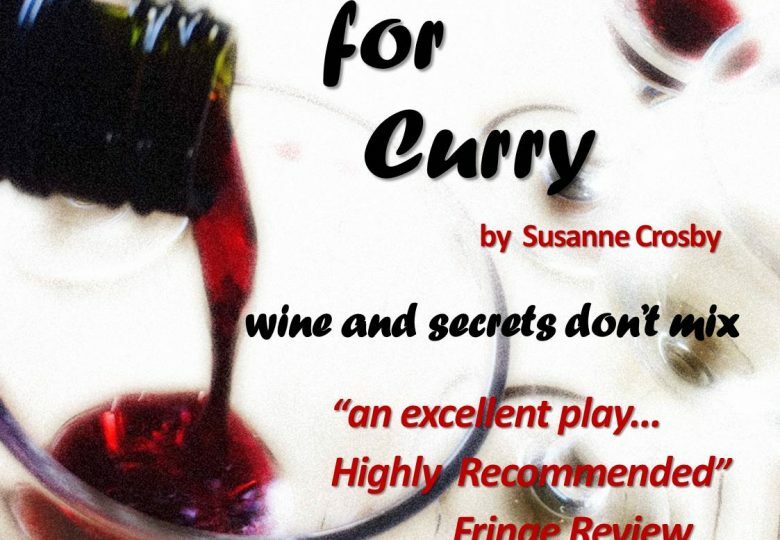 Fringe Review called it “an excellent play” and classed it as “Highly Recommended”. So this year, with the support of the lovely people at Sweet Venues, we have a longer run in the hope that everyone who wants to see it can get in! One of the bits of feedback we received over the premiere was that when the audience were packed out, it was harder for people at the back to see what was going on when the characters were sitting down. So, we have a new set. It’s set in two of the four character’s home, so we’ve imagined a breakfast bar situation, where everyone is on higher breakfast bar stools in advance of the curry that they are waiting to take delivery of. We know this staging will make sure that everyone, no matter where you sit, will be able to see everything. But putting this together has not been without its challenges! All four of the original cast were asked to reprise their roles for this production and all of them agreed. However, with a seven night run, and a lot of rehearsals scheduled, it was becoming increasingly difficult for the two actresses to be part of it, due to family and other commitments. Then one of the actresses landed a role in a shorter run play but one that has the likelihood of becoming mainstream in West End – so both actresses in the end had to sadly pull out. Then, just before rehearsals were due to start, it was clear from being committed to 4 other productions, one of the original male members of the cast would not be able to perform in this either. We miss them and wish them all the luck in the world for their next ventures and no doubt (unless superstardom awaits) we will be working with them again. Did this send us into a panic? Well, perhaps a little. But there brilliant thing about Twilight Theatre is the amount of talented actors and actresses that we already know and love, ones we know would be perfect for the roles, ones we can call on to ask could they possibly be available for a 7 night run for a brilliant play in the middle of the Brighton Fringe? Yes was the answer. With the writer / director filling the last remaining female role, cast, with 5 weeks to opening night, was set. Of course with the writer / director (who is also an actress) now being in the play, someone else had to be brought in to co-direct, for perspective and assistance with portraying the overall vision. 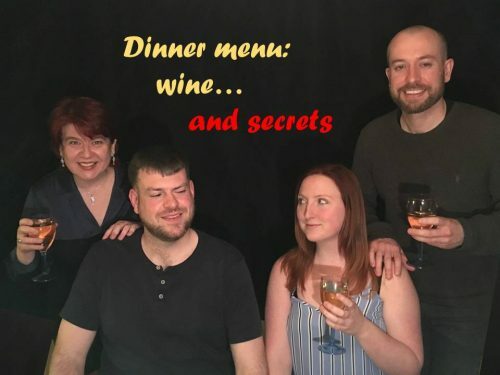 This is in the shape of the writer / director’s husband, himself an actor / writer / director, and this team is putting together a superb show with very talented actors.